As well as illustrating wedding dresses for leading couture designers such as Phillipa Lepley, Jane has produced images for wedding magazines and events. Her work has found particular favour with wedding planners, event organisers such as Quintessentially Weddings Atelier, brides and grooms. 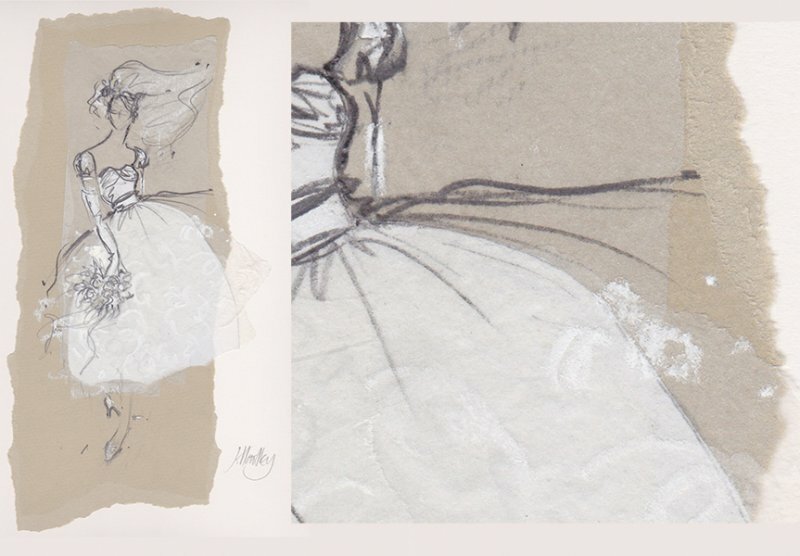 Her style is particularly suited to live sketching throughout the wedding day, as well as sketching at the bride’s and bridesmaids’ dress fittings. After the event Jane combines her sketches from the day in a specially silk bound volume, or as a framed montage, which includes any variety of sketches and memories for the couple to keep; the invitation, photographs, place cards, guest salutations,confetti, samples of lace, beads and dress fabrics. © Jane Hartley 2019. All right reserved. No material should be copied or duplicated in any form at any time without the express permission of the artist.